Walt Disney wanted Disneyland to be a place where you can't get lost or tired unless you want to. He may have been a little optimistic, but these practical tips can help you come as close to his ideal as you can. They're based on nearly two decades spent having fun at Disneyland, with both triumphs and failures. Don't embarrass yourself. Check the nine things you should never do at Disneyland and memorize the 13 words you need to know before you go to Disneyland. Find out what you need to know about Disneyland hotels, where they are, how hotel operators can fool you about locations, what "walking distance" really means and how to choose your perfect place to stay. Check the guide to Disneyland opening and closing times especially if you need to know what hours are in general six months from now. Don't miss out on the things you can get for free at Disneyland. No matter when your birthday is, check the guide to birthdays at Disneyland, so you don't miss out on all the extras. 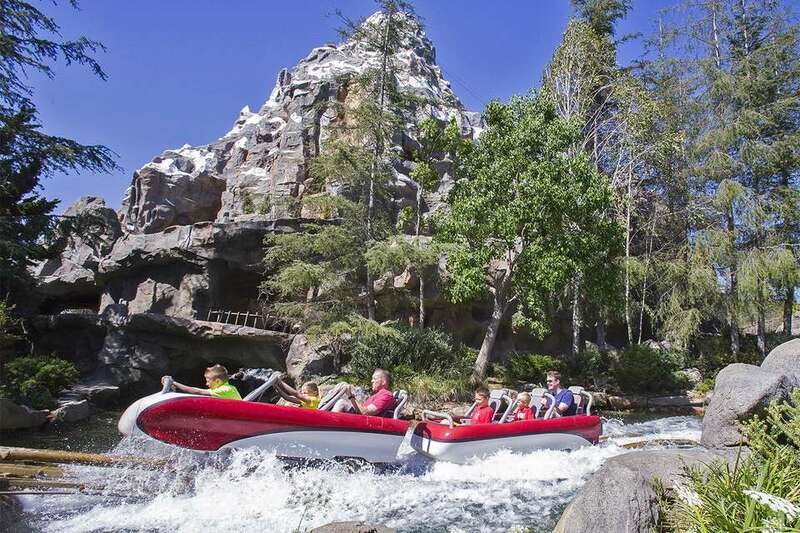 Get more tips when you browse through the Disneyland vacation planner: It will give you a lot more than can fit on this one page. Find out what you need to pack for Disneyland - and what you don't. This guide is just gals going to Disneyland, with all the things you might not think of packing. Dive into Disneyland with these 43 tested Disneyland tips - and eight that are out of date. Check the 32 California Adventure tips, tested and proven to work. Learn how to actually meet and greet the characters, and you can dance with Donald Duck, greet Goofy, or say hi to Cinderella. If you want to have a character meal or eat at one of the table service restaurants in the parks (like Blue Bayou or Carthay Circle), make your reservation 60 days ahead of time. If there's a ride you must enjoy, check the Disneyland website for ride closures. Haunted Mansion closes every September and January for the switch over to Haunted Mansion Holiday. It's a small world is closed in November and January. If attractions close for long periods of time, they may be listed in the guide to what's new at Disneyland. All of the shops, restaurants even food carts take credit and debit cards. You'll also find Chase Bank ATMs in each park. Some people say to take water bottles with you and fill them at the water fountains. But you have to carry that bottle around all day. And you might think water fountains are icky, germ-laden messes. You can ask for a large cup of water at most counter service restaurants, and it's free - but a time-waster unless you're buying something to eat, too. Your best bet may be to just pay for ice cold water when you need it. If you plan to check out of your hotel in the morning and want to leave your car there all day, ask them in advance if that's allowed. Some hotels charge for it, and others offer it only on a space available basis. You can trade pins with cast members, but you have to get your pin first. Buy them before you go to save money, but make sure you're getting something that meets their trading guidelines. Don't show up at the gate wearing something that's not allowed. Check the rules for attire before you pack. Get a lanyard and use it. It might look kinda dorky, but it's the safest way to be sure you don't lose those non-refundable, non-replaceable tickets - and those precious FASTPASSES. Get a good day bag. Find out what Disney's restrictions are and get some recommendations. Pack the right stuff. The last thing you need is to get to Disneyland and discover that you left something behind. Use this guide to packing for Disneyland to avoid that. If you're worried about losing track of your kids (or even your friends), think about getting a bluetooth tracker for each person. Allow time to purchase them and set them up for each person before you leave home. If you need a Starbucks fix on your way into the parks, get the Starbucks app and top up your account balance. When you get on the tram or start walking from your hotel, order using the app. You can zip right in and pick it up instead of standing in line. You can only pre-order from the Starbucks in Downtown Disney There are two: Starbucks Downtown Disney Store is next to the Disney store and closest to the Mickey & Friends tram stop. Downtown Disney West is closer to the Disneyland Hotel. Get there early. On days when there's no early entry at the park you're visiting, be there at least half an hour before the official opening time and you might get in early. That means planning for driving or walking time and allowing time to get through security. Start in the right place. If the park has an early entry day and you're not participating, it will be busy by the time you get in. You know what to do, don't you? Just go to the other park first. Know the weather. It might fool you. Sunny summer days feel hotter than what the thermometer says. May and June mornings can be cool and cloudy, but get hot and sunny by midday. To be better prepared, check the guide to Disneyland weather and what to expect. Know how to cope with rain. Umbrellas are hard to manage. Bring hooded rain gear and enjoy the park anyway. Lines will be shorter. However, a few rides may be closed. Take your big vehicle to the right place. Use the main entrance at Mickey and Friends, just off southbound Disneyland Drive at Ball Road. The height limit is 13 feet 10 inches. Park in the Mickey and Friends Garage. Why? Because it's the only place you can catch the super-cute space-age-style trams - and who want to arrive at Disneyland in a boring old bus? Know your parking location. Parking spaces can all look the same after a long day. Prevent end of day panic by writing it down or photographing a nearby sign. Don't get delayed. Disneyland's security rules about layered clothing cause the most delays. If you are wearing a jacket or a blouse over a t-shirt, they will probably pull you to the side and use a metal detector wand before letting you pass. To speed up entry, put your jacket in your bag (or button that shirt all the way up). Know the rules about smoking. Smoking is restricted in the Disney parks, even outdoors. Get the details about smoking areas on the Disneyland website. If you’re used to dining plans at Disney’s other locations, they’re different in California. They don’t save money and are seldom used. For a quick breakfast, try La Brea Bakery. Just outside the security gate on the Downtown Disney side. Even when there's a 45-minute wait at Carnation Cafe and the River Belle isn't open yet, you may get immediate seating there. They also have tasty to-go breakfast items. Disneyland food policies allow water and snack foods, but not a full meal (except for guests with religious restrictions or special dietary needs). Coolers are restricted to six-pack size. No glass containers are allowed except small baby food jars. To minimize time spent waiting for rides, learn these seven ways to stay out of line. It summarizes every trick and strategy with their pros and cons. Minimize waits everywhere else. Outermost lines tend to be shorter in most places. Especially in the parking lot and in food service lines. At the entrance turnstiles, the middle lines are often shorter, especially in the morning when people are pouring in from both sides. Cut through the crowds. Don't get stuck behind that slow-moving bunch of people. Stay on the edges of a crowd that is moving. Look straight ahead and people will get out of your way. Find a line of people who are moving faster than the rest and follow them. Use a crowd prediction tool. The most popular one is at isitpacked.com which is free. Touringlans.com also has a crowd rating tool that's based on wait times over several years, but you need a paid subscription to access it. Trips With Tykes offers some general tips that may help. Know which tips don't work. A frequent tip is to try for a popular ride or go for a meal during the parade. Detailed checking of wait times before, during and after the parade reveals that this one is more legend than truth. Dress for less stress. Wear comfortable shoes. Bring warmer clothing for the evening. Even in summer, it can get chilly after dark. Don't carry too much. You're not a pack mule. You have to drag every ounce around all day. Go through your bag several times and remove all non-essentials. Put everything in your pockets if you can. Stow your stuff. You'll find rental lockers both outside and inside the park gates. Stow dry clothing, jackets, snacks, and so forth here so you don't have to carry them around all day. The smallest-sized locker will hold quite a bit of stuff and it costs about the same as two fancy coffee drinks from Starbucks. Don't suffer. Got a headache? Blister? Upset tummy? The First Aid Center can help. Take a break. People often miss the evening parade and fireworks because they are too tired to stay that late. Don't let that happen to you. Instead, get out for a few hours in the middle of the day. Go back to your hotel for a nap or a swim. Get a nice lunch somewhere nearby. Or just sit down on a bench and watch the people, then take in an indoor show or two. Avoid a photo fail. Disneyland photographers will take a photo for you with your phone or camera. So will character hosts, which lets everyone in your group get in the shot. You can also take photos of the display screens for ride photos, which is not allowed at some other theme parks. Know what to do if something breaks. If the souvenir you just bought - or if that cute balloon went pop - some people say you can get a free replacement the same day. Manage your power. Mobile devices batteries will last longer if you turn off your data and put them in airplane mode when you're in dead zones like Indiana Jones and Soarin'. If you eat in a table service restaurant, you can ask your server to plug in for you. If all else fails, stop taking photos and get a Photo Pass from a Disneyland photographer instead. You can also take a mobile charger with you. As soon as you get your park ticket, photograph the back of it (the side with the barcode) and make it your phone’s lock screen. Use it at the Fastpass scanners. You’ll still need that paper ticket for the Fastpass machines, but after that, you can keep your precious ticket safely stowed and not worry about losing it. Going back to the car for things wastes time. You might think it also saves money because you don't have to rent a locker. That's true, but by the time you wait for the tram both ways and go through security, you'll lose about an hour of park time. Check your food receipts. They sometimes have discount coupons at the bottom that can save you money on purchases. Be extra nice to cast members. They have a hard job and don't get much appreciation for it. Cast members say super nice people might even get a little extra from them as a thank you. Be nice to other guests. If some of the people in your group aren't going with on that FASTPASS ride, get them passes anyway. Then give them away to someone who thinks they're going to have to stand in a long line. Measure your child's height before you visit, and check the Disneyland and California Adventure ride descriptions so you'll know which rides they can go on. It could save a temper tantrum. Cast Members know all the tricks, so don't even try to fool them and please don't ask for exceptions. The height limits are there to keep your kids safe. Kids of any age can go to the Disney parks. Anyone 14 or younger must be accompanied by someone older than 14 to get in. To board an attraction, kids under age seven must be accompanied by someone 14 or older. Disneyland is a good place for kids to learn how to navigate with a map. Let them find the way to the next attraction for you. If you and your child get separated, ask any Cast Member for help. They're very efficient at reuniting lost kids with their parents. Prepare your kids by telling them how to identify a Cast Member by their badge, stop one and talk to them and then make sure the kids know what do to if they're lost. Be sure the kids have your cell phone number with them - or some parents write their number on their child's arm. During the busiest, hottest time of day, go back to your hotel for a swim or a nap, being sure to get your hand stamped on the way out and keep your paper ticket. Return later when it's cooler and you're rested. Use the Baby Care Center. You don't have to struggle with taking care of baby in a public place. The baby care centers have facilities for nursing, formula preparation, and diaper changing. They also have microwaves for warming up food. Draw the fun to the kids. During parades, cute children sitting on the curb are more likely to get attention from the parade participants. Get there early enough that they can be up front. Dress them up in bright colored clothing or give them something cute to hold. For Fluffy and Fido: There is a boarding kennel near the main entrance. The kennel is for day boarding only, and they charge a daily fee. If you have mobility issues: You can rent wheelchairs, ECVs, and strollers or bring your own. For all the details about visiting Disneyland with mobility issues, check this guide. If you need help in a language other than English: Look for cast members wearing a small flag pin with your country's flag on it. They will speak your language. If you need to keep your medication in a refrigerator: Take it to First Aid. If you have any food issues including special diets and food allergies: Don't worry and guess what's safe. If you ask someone, you can usually speak to a chef who can help you get what you need. If you need audio assistance: You can get assistive listening devices and closed captioning at Guest Services. If you need a sign language interpreter, contact guest services before your visit to find out the current schedule. If you need visual assistance: You can get audio description devices, Braille guides and audio tours at Guest Relations. For cognitive disabilities: Lots of services are available, including attraction guides that describe special effects, flashing lights and loud noises. Have you seen the tip that says you can get a free pickle by asking the cast member how their day has been? I’ve seen it making the rounds on Pinterest, and it’s apparently been a hoax from the beginning. Free coffee refills ended when Starbucks took over the coffee shops in both parks. Some tips say that you can take outside food into the parks. That's only partly true. You can take snacks, but not a full meal. People also post a photograph of Woodie and Jessie characters laying on the ground because someone shouted: "Andy's coming!" That's not going to happen.